· Smaller Bing Table Top Railway is developed. 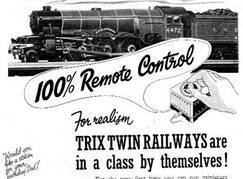 · Trix Ltd in England introduces Trix Twin Railway with a range of 00 models at the B.I.F. in 1936. · Public demand leads to rapid development of new models. 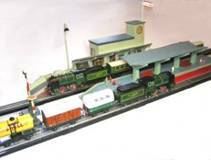 · Princess , Flying Scotsman and Coronation Scot locomotives follow. · Many other Trix innovations. · Exciting models such as Elevator Conveyor produced. · Trix Trains start of changeover from AC to DC. · Trix Ltd and their cousin Trix Express in Germany experiment with more children friendly trains such as Battery operated sets. Take a look at Exhibition layouts over 77 years ! !